Renovations to the Marvin Center that will be in the works for five years began last month. While that space is in flux and likely to get noisy with construction, you may find yourself dreaming of a traditional campus with a bustling student center. Put away your buff and blue for the day and check out these student centers at universities across the District if you need to get work done but also feel like getting away from Foggy Bottom. Georgetown University’s recently renovated Healey Family Student Center has a pub and salad shop inside. Our hilltop neighbor just got a brand new student hangout – complete with all the bells and whistles. The Healey Family Student Center is furnished with floor-to-ceiling windows that showcase some of D.C.’s finest views, like the expansive Potomac River framed by the D.C. skyline. 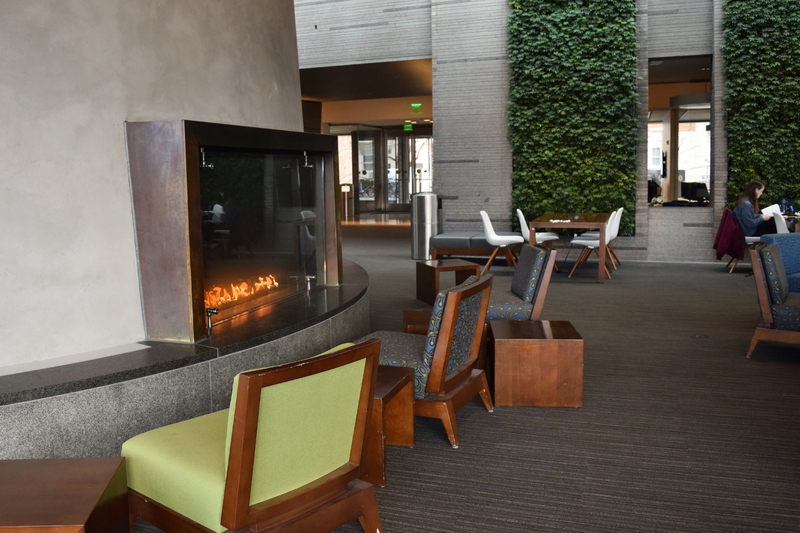 You have two options to enjoy the view, even in the winter: a seat in front of a cozy, modern fireplace inside or outdoors by a fire pit on slightly warmer days. Georgetown students use the Healey Center for studying at the various private cubicles and group study rooms, just like at the Marvin Center. Students relax on large chaise couches across from the living green wall, which is a similar but slightly larger version of the one in the basement of the Science and Engineering Hall. The Healey Center houses two student-owned and operated food options that are slightly more appetizing than now-defunct J Street’s options. The Bulldog Tavern serves up traditional pub fare and Hilltoss is a hot-spot for salads and smoothies. What really gives Georgetown’s Healey Center a leg up on the competition is its mini-movie theater. The theater holds about 50 people and shows movies that aren’t even out of theaters for free Friday and Saturday nights. “The Pryz” at Catholic University is filled with windows for lots of natural light. Catholic University is just a short Metro ride away on the Red Line and its student center, which students dub “the Pryz,” takes you out of the District for a moment and feels like a student center you would see on a traditional college campus. 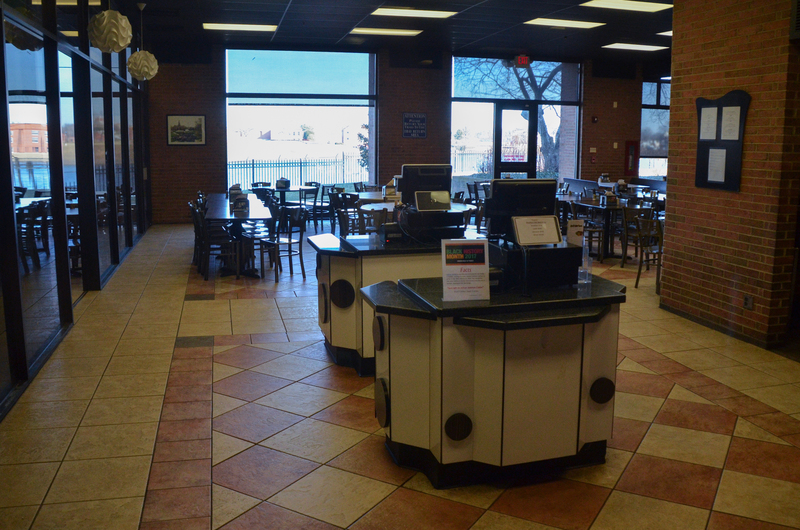 The Pryz sits right at the center of campus and houses all of the campus’ dining options. It has ample study space, for both individuals and groups, as well as places to relax. In a sea of old stone structures, the Pryz immediately stands out as one of the only glass and stucco buildings. Inside, the rooms are filled with natural light streaming through the windows. The Pryz has a wide array of unique dining options. 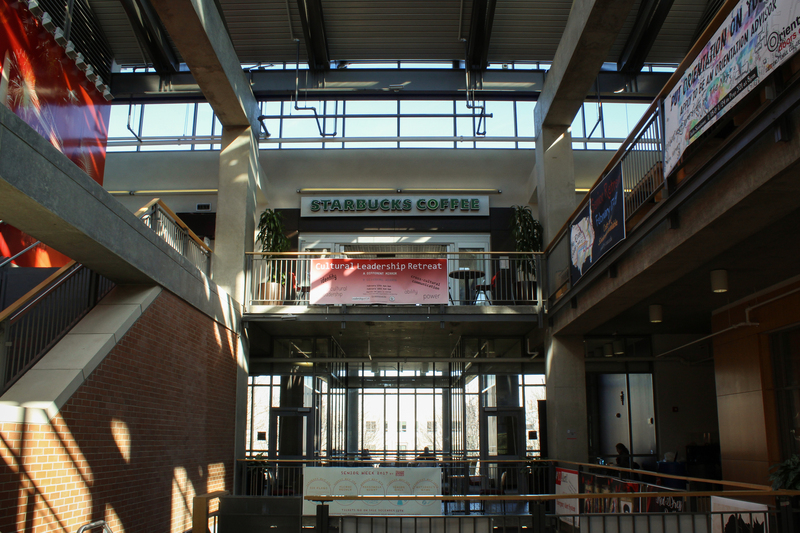 The space has independent vendors – like Chick-Fil-a and Starbucks – as well as a cafeteria-style dining hall. The warm walls, oversized chairs and tables throughout the different rooms provide space for people to spread out while they work. Some of the rooms are solely dedicated to studying, which is a nice option for people who want to work in peace and not be disturbed by chatter and people eating. For anyone who has struggled to find the perfect study spot that is both subdued and social, the Pryz is the perfect option. Howard University’s Armour J. Blackburn University Center overlooks the MacMillan Resevoir. Howard University’s Armour J. Blackburn University Center has different floors for students’ varying interests and needs. But it lacks the access to study space and a quiet place to relax that can be found in the Marvin Center. The brick exterior of this three-story building gives it an old feel, while the huge window panes and art on the second floor give off a modern vibe. The lower level is well-lit, and the ground and second floors utilize large windows for natural light in the open spaces. The main floor consists of long hallways with bathrooms, offices and meeting rooms that are available for students and faculty. The end of the hallway leads out to a beautiful balcony with tables that look out over the McMillan Reservoir. This relaxing space takes students out of the hustle and bustle of D.C. for a while. On the lower level, the Blackburn Center is reminiscent of GW’s former J Street dining hall. The dining options include Mein Bowl, Wow Cafe and other eateries by Sodexo – GW’s former dining provider. Upstairs on the second floor, students were more focused and could be found doing homework, but seating was limited and the Blackburn Center’s overall energy was loud and rambunctious. From this floor, the Blackburn Center offers a picturesque balcony that stretches in three directions, so students can see a bird’s eye view of The Yard or look out at McMillan Reservoir. 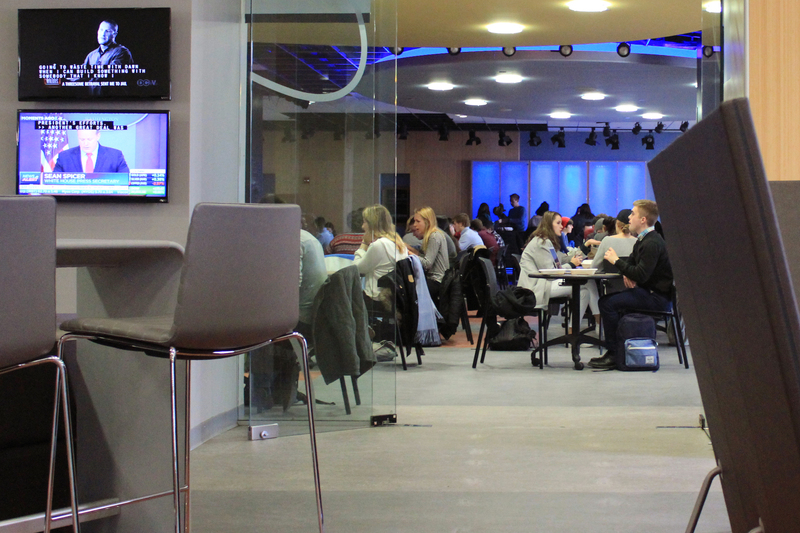 American University’s Mary Graydon Center has a joint dining and study space. American University’s Mary Graydon Center – which students call the MGC – looks like an old-fashioned academic building from the outside. Behind the pillars and concrete exterior, however, the student center features modern seating and study spaces. Much like the Marvin Center, the Graydon Center offers a joint dining and study space for students. The student center occupies the first two floors of the building, while the third is home to classrooms and a theater. Food vendors at the Graydon Center include Pi & Fry, Einstein Bros. Bagels, a mini mart and a buffet-style dining hall. When I visited around 9:30 a.m., the center was sparsely filled. AU students said the center tends to get crowded around 10 p.m., usually because sororities and fraternities have tables reserved for study hours. The Graydon Center has no lack of seating, which makes it an appealing place for solo studying or group projects.